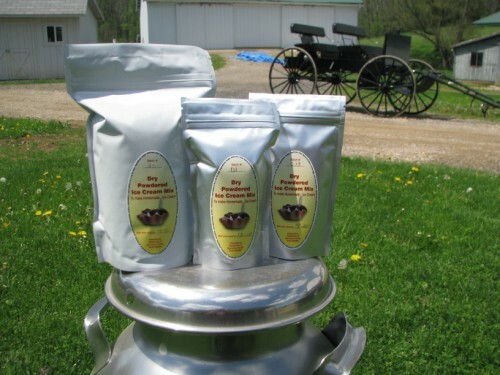 Homemade Ice Cream Dry Powder Mix Packaged For Amish Ice Cream Freezers/Makers. Dry powder vanilla ice cream mix is prepackaged for different sizes of ice cream freezers. Add syrup for chocolate and other flavors. Requires additional additives of white sugar, milk, condensed milk, and heavy whipping cream. Processing and packaging are inspected by the Ohio Department of Agriculture. 1-case will provide 12 mixes for the 4-qt to 8-qt freezers. 4-qt is our smallest prepackage mix. It will need to be proportioned down for the 1-qt and 2-qt freezers. For the 20 qt 5 gal freezers, we offer a 15 pack carton 28 oz per package Click Here for more information. Use the drop-down box to make your selection. Prices will incrementally add to the 4 qt size.